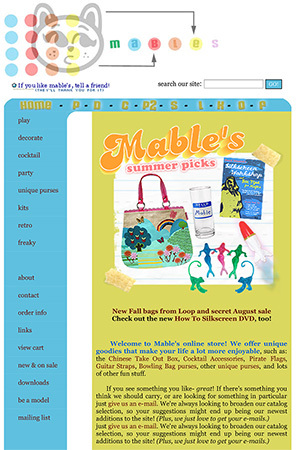 Mables.com Has Always Rocked. And Always Will. Mable’s was born in the year 2000. *wipes away nostalgic tear* We launched our first dot com shortly after graduating high school, and the dot com crash. While our friends were getting pink slips from their IT jobs, we were dreaming of making our own super fun online business. Our vision wasn’t crystal clear yet, but we knew we had the entrepreneurial spirit and wanted to share playful, creative, fun items to our customers. After many hours teaching ourselves every aspect of web development and running an e-commerce site, Mables.com version 1 launched. 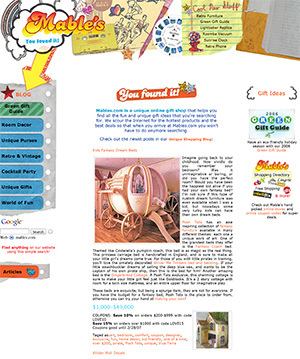 A spare bedroom served as warehouse, and we sold novelties and toys to customers around the world. Talk about a labor of love. In 2005, everything changed. The namesake of our business suddenly passed away, and in the wake of that, we were open to some major changes. And then a revelation came. “If we feature products and move away from retail sales, we can share a boatload more fun items!” Perfect. We were so stoked on the idea, we literally made the decision within minutes of suggesting it. The website got a swanky new facelift that showed off our playful side and a focus on vintage & retro items. This was our breakout period. Streamlining was needed in both our product offerings and the user experience. We redesigned the site again, this time with a clean, easier to browse layout. Eco-friendly gifts made their debut. Products that we didn’t find personally interesting began to leave our catalog. Our blog posts and product descriptions better reflected our true voice. Mable’s found its true purpose at the time: have fun and be yourself. Follow that still, small voice inside, kids. That’s the lesson here. After years of making vintage fashion a bigger part of the Mable’s brand, we made the plunge and decided to focus exclusively on vintage clothes! This stays true to our earlier messages of honoring the planet, and expressing ones true self in bold ways. We’re excited to showcase the most amazing genuine vintage and reproduction vintage-look fashion on the Internet!